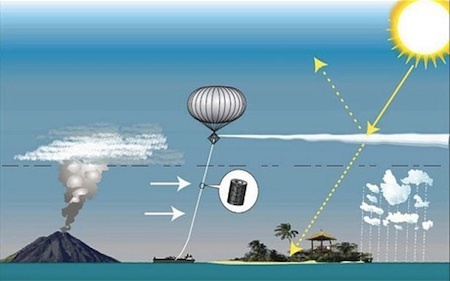 SPICE (Stratospheric Particle Injection for Climate Engineering) is a bold experiment to create an "artificial volcano" that would lower global temperatures. The intent is to pump a large volume of water and disperse it at an altitude of at least one kilometer as a test of the technology. The effect would be similar to that of a volcanic eruption spewing out clouds of sulphate droplets which can have an impact on the climate. Constructing artificial volcanoes to alter climate is seen as a ''last resort'' if it proves impossible to bring carbon emissions under control. Pouring 10 million tonnes of material into the stratosphere each using 10 to 20 giant balloons could achieve a 2C global drop in temperature, the scientists believe. Sulphate emissions from the Mount Pinatubo eruption in the Philippines in June 1991 reduced world temperature by 0.5C for two years. Experts believe particles of clay, salts or metallic oxides suspended in liquid would prove more effective than the sulphates produced by real volcanoes. SF fans may recall the climate-tailoring effort in The Mote in God's Eye, the 1974 novel by Larry Niven and Jerry Pournelle, which used an actual volcano for the dispersal process. Potter was doing most of the talking and all the pointing. "Those twin volcanoes; d'ye see them, Mr. Renner? D'ye see yon boxlike structures near the peak of each one? They're atmosphere control. When yon volcanoes belch gas, the maintenance posts fire jets of tailored algae into the air stream. Without them our atmosphere would soon be foul again." Via Scientists to create artificial volcano for climate change experiment.